If you read our article on a consistent basis you’ve been hearing about a decrease in pending sales and a potential shift in the SW Florida real estate market. Official numbers confirm a February real estate sales drop in SW Florida. Nationally existing home sales fell 7.1% in February. Locally home sales were down 12.8%. This wasn’t a difficult prediction to make as we’ve been watching pending sales decline. The good news is we made some adjustments to our listings in reaction to the market and we’ve been able to get many of our listings under contract in March. Regardless of whether the market is up, down, or sideways, understanding the market and making changes can be the difference between success and riding the merry go round awhile longer. 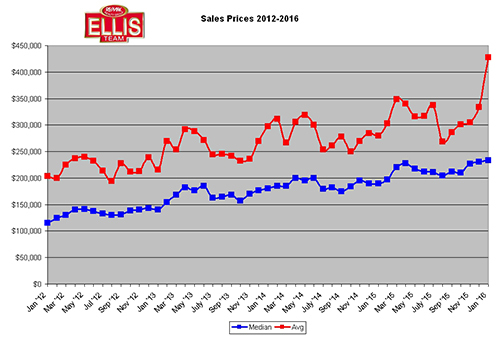 Median sales prices are up 11.8% over last year. They are down 6.95% from January numbers. Average sales prices are down 1.2% from last February and down 31.23% from January. This is why we use median price as a more valid indicator than average price because it’s a more stable indicator and less susceptible to wide variations due to a few large or small sales. It does tell an interesting story though. While we hesitate to read too much into one month, we did see a fall-off in sales and prices in February. SW Florida wasn’t alone as the overall US market seems to be affected as well. We have a new metric to track which is the total dollar volume of the local market. Obviously if sales are down it will influence this number. When prices are rising its not uncommon to see declining sales as less people can afford the higher prices. If you have lower sales you can sometimes make up for it with higher prices, but we didn’t see that this month. 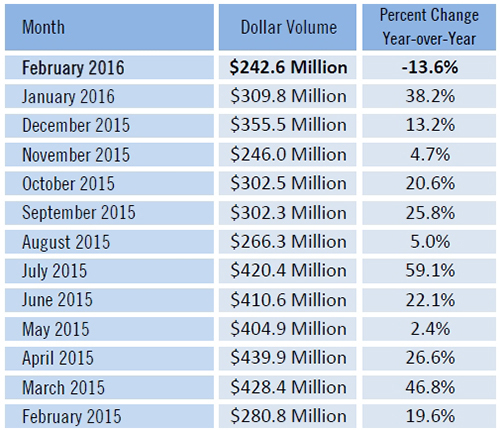 Total dollar volume fell 13.6% in February. We’ll be keeping an eye on this indicator going forward and help you track it. It pays to know the numbers. If you ask an agent how the market is doing most will give you an honest answer based upon how their own sales are going. Knowing the underlying numbers is critical. If an agent is having a good month or a lousy month it may have no bearing on what the overall market is doing. I would even go so far as to tell agents you’ll have better months if you study the market and take actions for your clients based upon what’s really happening. New pending sales fell 12.1% in February and new listings increased 14.3%. This tells us March and April sales might not be at 2015 levels either. Keep in mind some January pending sales may get extended into March as new lending guidelines can extend some closings. Buyers may have a few more choices if new listings keep rising. We have a pretty healthy market, but as of right now, gone are the days when the seller can name the price and the buyer had to comply if they wanted to buy. It’s a more balanced market now and sellers must justify their price. Buyers and sellers are on a level ground in many price ranges with the seller still having the upper hand in a few ranges. If you’re looking to buy or sell, consult a professional who can guide you through the market, financing, and closing process. We’d be happy to help 239-489-4042 or visit our Free SW Florida MLS Search Site where you can search the MLS for free and do valuable market research. Last week we wrote about sellers in SW Florida who have had their home on the market this season and their home hasn’t sold. We talked about market activity and closing statistics as well as the latest pending stats. In that article we mentioned one sentence that elicited responses from readers “We have a graph we send our sellers that shows typical showing activity.” This week we’ll focus on the question, is your price on target? We have a lot of information we send our sellers that educates them on how the industry really works and how best to sell their home. 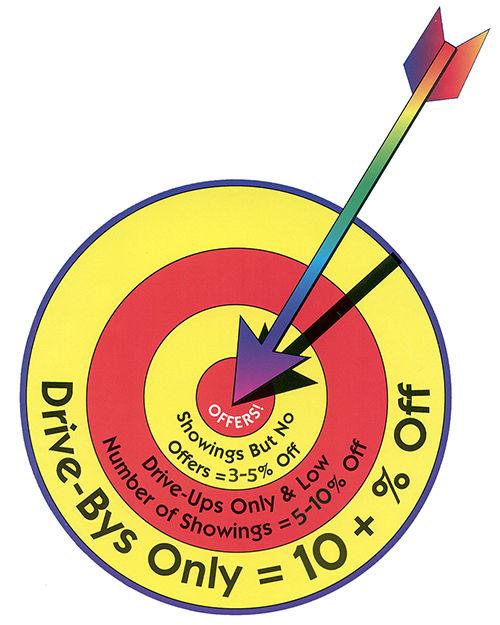 We don’t normally share all this information with the public, but in this case we’re going to share the pricing target graph. This graph is based upon research and showing data over many years in many markets. We know that the seller sets the asking price and the market determines the value. Over time the market speaks to us. Some sellers place their home on the market and receive lots of showings, while other go on and receive little to no showings. Is the market speaking to you? Perhaps this guide may answer some of those questions? If you are getting showings but no offers it generally means you are in the range 3-5% above market value. If your number of showings is low and you’re experiencing a lot of drive-ups but the buyers don’t come in to see the home, your home may be 5-10% overpriced. If you aren’t receiving showings at all, then your home is likely priced 10% more above what the market will bear for your property. Many sellers say things like “Well, we can always come down but you can’t go up” , or “They can always make an offer”. The reality is buyers don’t make an offer when a home is overpriced. They make offers on other homes that are priced correctly. Many times they don’t even view the overpriced listings because it’s not what they’re looking for at that price. Overpricing a home hurts a seller two ways. Legitimate buyers in that range are used to seeing other homes that offer more than yours. When they view yours, it just doesn’t measure up, so they will never buy it. The actual buyer for your home never sees it, because it’s not on their radar screen. It’s priced above where they are looking. So you miss the mark 2 ways. Sellers that overprice never had a chance. So when we hear things like “They can always make an offer” we know that they won’t be receiving that offer. A lot of sellers call us blaming their crappy real estate agent because their home hasn’t sold. It may not be your agent’s fault. Have you listened to your agent and had the pricing discussion? Now if your agent suggested a higher price and never communicated with you how your home is stacking up against the competition, you might have a point. Many times it’s the owner who wants more than what the agent says, or they Realtor shop until they find one that agrees with them. You’ve heard of Doctor shopping for pills. That’s a bad thing, and so is Realtor shopping for an agent that will write you a price prescription. That prescription never works and can do you more harm than good. Our suggestion is call a good Realtor who knows the market. You may not like the medicine he/she recommends, but a bitter pill only last a few seconds while taking the wrong medicine can hurt for months or years. Plus, we live in paradise. Life’s too short not to move on and get what you want. When you overprice you delay your goals. You’re not moving on to where you should be. You’re trapped in your current circumstance, just because you wanted more than what the market would bear. That’s usually an ego thing. It’s human nature. We all do it. The real question is, are you going to let ego and greed hold you back? Some people do and they regret it for years, and some accept the market, take their medicine, and live their dreams. So your home hasn’t sold yet this season? Don’t fret; you’re in the same boat as a lot of Lee County home sellers. 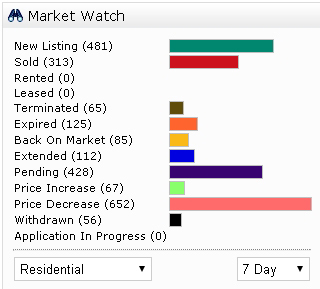 January and February started off a little slower but we have seen an increase in buyer activity the last few weeks. Will it translate into stellar numbers? We’ll have to wait and see. 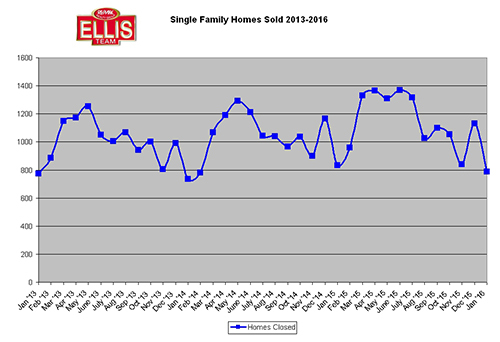 January closings were off but we’re predicting February number of closings to come in higher than last year. 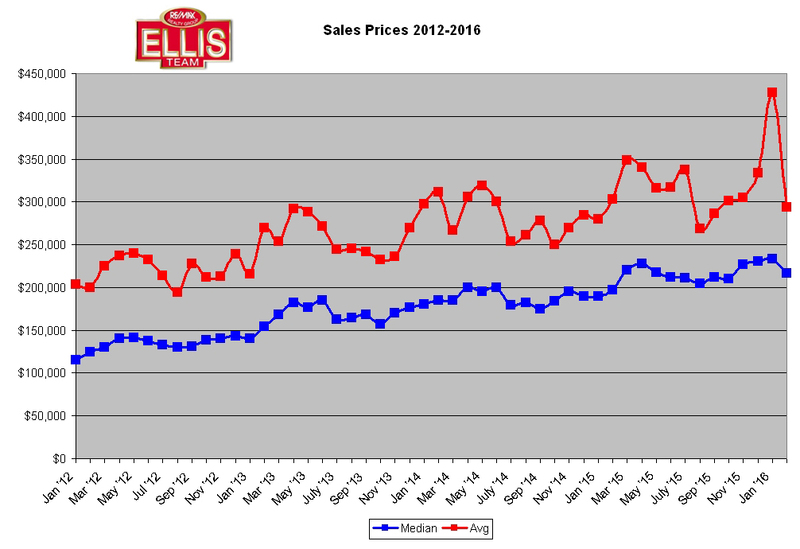 So far sales prices are up versus last year but not so much over previous months. We have noticed some multi-million dollar closings in February which will help the averages but not necessarily the median prices. So your home is on the market and you’re wondering if it’s time to worry. Worrying won’t do you much good. It’s important to study the numbers and if there has been a shift in the market the sellers most informed will get out first. Our market is constantly moving and being influenced by external forces. It pays to keep abreast, especially when you’re ready to buy or sell. If your home has been on the market awhile it’s either not being marketed correctly or it’s overpriced. It could be both. 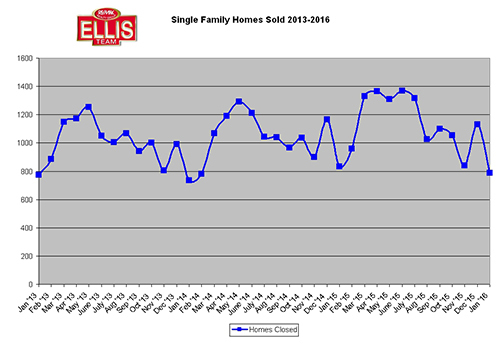 We have a graph we send our sellers that shows typical showing activity. If your home isn’t receiving any activity chances are you’re overpriced. If it is receiving activity, a small adjustment may be in order. Look over your marketing. Do the photos put your home in a good light? Does the listing description paint a true and enticing picture of your home? Is your home being marketed locally in print as well as globally online? Does it go out to sites like HGTV, Realtor.com, Zillow, Trulia, propsmart, Homes.com, Livedeal, Dupont Registry, etc? We submit your home to over 100 websites as well as advertise in the News Press and other local outlets. If your home is For Sale By Owner you’re at a disadvantage as we haven’t found a seller yet that can expose their home properly to the market. Now you might say it only takes 1 buyer, and this is true. It only takes 1 qualified buyer who likes your home above all others and sees the value above All others. If you’re not exposing to the full market, chances are you’re going to have limited success, if any. If your marketing is good, how is your price? One way to research is to look at Market Reports for your neighborhood. Go to www.LeeCountyOnline.com and click on Market Reports. If you don’t see yours listed yet, you can create your own. Sellers love this feature. Of course, you can always call us out and we can sit down with you and answer your questions. A real estate expert can guide you through the process from correctly pricing to offer simple repair and maintenance tips to get you Top Dollar. When interviewing agents be sure to look at their marketing plan. You’ll be surprised to note that not all Realtors market the same and there can be vast differences. Make sure you know what you’re getting. Lastly, no matter which agent you select, keep in mind that the seller sets the price, but the market determines the value. It pays to price your home at or close to market. If you have questions, give the Ellis Team a call. 239-489-4042 We’re never pushy and we present you with your options so you can make the best decision for your family. Official January 2016 real estate sales numbers are in for SW Florida and as expected single family home sales fell 5.5% Condo sales were down 7% from last year. Median sales prices were up 22.6% over last year; however they were only up .87% over last month. We did see a big jump in mean average sale prices in January, going from $280,186 in 2015 to $427,536 in January 2016. That’s a 52.6% jump. One reason we don’t use the mean average is because one large sale can skew the numbers. Pending inventory fell 13.6%. Some say it is because we have fewer inventories to sell while others suggest the market may be taking a breather and leveling off. Now that the stock market has recovered some and oil has rebounded off its lows, maybe we’ll have a sense of stability going forward. Of course we have that election thing hanging out there and I think everyone can agree this election cycle is like nothing we’ve ever seen before. If uncertainty creates confusion, we’ve got it in this election process. Within the next few months perhaps the economy’s future will come into focus and people can start planning where they want to go with their real estate desires. So many in SW Florida have options now that their mortgage has paid down and prices have risen. Many feel like they’re no longer in jail and are free to explore their options. We’ve seen an increase in local homeowners considering a move. They need to properly value the current home they have and see what improvements or repairs are needed to make it most sellable. They also want to know what they can buy if they do sell. Our website www.LeeCountyOnline.com is great for both because you can search all the listings available for sell, as well as see sold and pending data in your neighborhood via the Market Reports section on our site. There is even a button to receive an online computerized valuation of your home. Deciding whether to sell a home and buy another home is like putting together a puzzle. All the pieces have to fit, and when they do you have to decide if you like the finished puzzle. There is no substitute for meeting with a professional Realtor who understands this process. However, if you just want to turn all the pieces over and begin putting the corners and edges together first, our website is an excellent place to start. If you’d like advice from a professional, give us a call. 239-489-4042 We’re friendly and never pushy. We simply present you with your options and let you decide what’s best for you. If you do decide to make a move, you’re not going it alone as you have someone by your side advising you and helping you with the process. We turn a complicated process into a smooth transition for you and your family.